Learn more about the gemstones used in Southwest and Native American artwork. We always go the extra mile to ensure your complete satisfaction. Native American Indians have been wearing and making jewelry for personal adornment long before the first Europeans reached North America. Southwest Native American jewelry made with silver started with the introduction of European metal-working. Before this time, jewelry was made with natural resources such as Turquoise, shells, stones, wood and bones.Turquoise Jewelry has been since ancient times.The most well-known southwest Indian tribes making jewelry today are the Navajo Indians, Zuni Indians, Hopi Indians and Santo Domingo Indians. Welcome to the Southwest Silver Gallery! Our goal is to bring to you finer Native American jewelry from the Zuni, Navajo, Hopi and Santo Domingo Indian tribes. We strive at selecting the finest in quality from award-winning and our favorite up and coming artists. 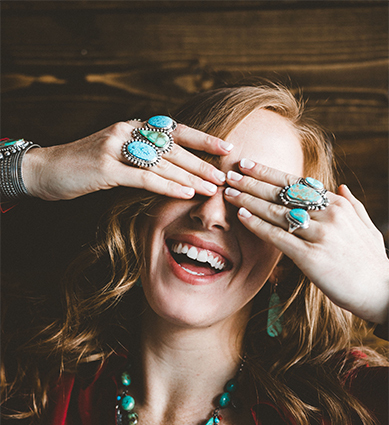 Our specialty is high-grade, rare, natural American authentic turquoise jewelry, yet we feature a variety of gems set in traditional to contemporary American Indian jewelry. On our About Stones page we have information on most of the stones we carry. Occasionally, we will offer a selection from well-known Southwest artists as well. Most all of our pieces are one-of-a-kind and are made with the highest quality of stones and materials available. We hand select each piece for its beauty, value and quality of workmanship and are able to offer to you a unique and distinctive selection of American Indian jewelry, including Navajo Indian jewelry. Our Zuni fetishes are authentic made by recognized Zuni carvers. The Zuni fetishes are a delightful, valuable work of art to collect. We give Certificates of Authenticity with both our Zuni jewelry and Native American Indian jewelry. Your purchase of our Native American jewelry is 100% Satisfaction Guaranteed. Your purchase is completely Satisfaction Guaranteed. You may return any item for your money back for the price of the item or exchange for any item within 30 days. We want you to be happy! We ask that when someone needs to return something that it is returned within 30 days of receipt and in original condition. You will receive a 100% refund of the price of the item. No questions asked! You may also exchange any item purchased from us. Free shipping back to you on exchanges of equal value or more. Christmas gifts ordered in November and December can be exchanged or returned through January 10th. The workmanship and design are excellent! I also appreciated the fast, efficient, and courteous service. I received my ring and it is absolutely gorgeous. The setting is so unique. It is a joy to wear. The bracelet came today (very fast!) and it is beautiful. I have loved everything I have bought from you. My new turquoise bracelet is stunning and I think it’s the most gorgeous one I’ve seen! I love it! I just wanted to say thanks for the prompt service and for a great turquoise ring with superior workmanship. The earrings arrived today and they are even nicer than they looked in the photo. I’m very, very pleased. 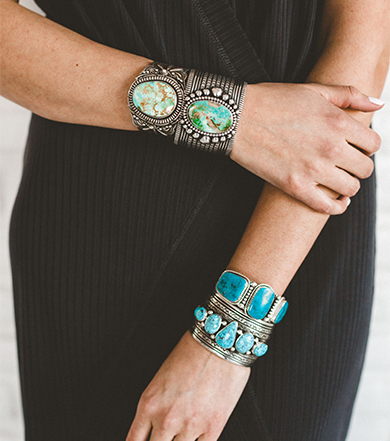 Southwest Silver Gallery is a leading provider of high-grade turquoise jewelry in the heart of the American Southwest. We offer an extensive selection of high-quality Native American jewelry designed to make a lasting impression. Whether you’re looking for jewelry to add to your own collection or to give as a gift, we guarantee our elegant pieces will not disappoint. Native American jewelry is simply stunning. More than just another accessory, it serves as a beautiful addition to every outfit, on any occasion. Wear it for a special night out on the town or let it dress up your casual attire. Our jewelry serves as a great conversation piece, as there’s an incredible backstory behind each and every piece. 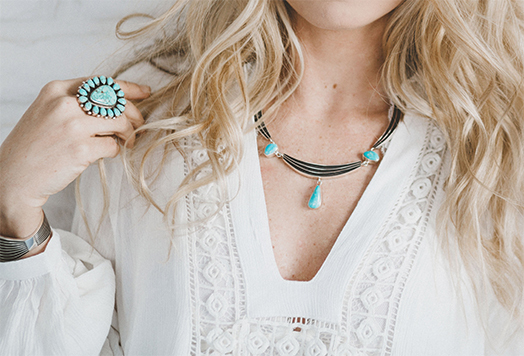 There’s a lot of fake turquoise out there, making it very difficult to distinguish the real pieces from the imitators. Sure, the imposters may look pretty for a while, but they won’t last. When you purchase jewelry from Southwest Silver Gallery, you can always be certain you’re getting the real thing. Our family-owned business has deep relationships with many award-winning artists. In fact, most of our stone and jewelry pieces are hallmarked with the artist’s official stamp. Our high-grade, rare, natural American authentic turquoise jewelry is created by the Zuni, Navajo, Hopi and Santo Domingo Indian tribes. We know you want authentic jewelry, and it doesn’t get any more genuine than that. No matter what type of jewelry you’re looking to find, we have something beautiful to meet your needs. A person’s taste in jewelry is very personal and unique, so we carry a huge selection of items to meet your needs. Choose from our selection of beautiful Native American pieces, including bracelets, earrings, necklaces, rings, pendants, watches and more. We have a range of sizes designed to fit everyone from young children to large men. Southwest Silver Gallery is the only retailer you need if you want genuine turquoise and Native American silver jewelry. We only sell jewelry of the highest quality. You can rest assured that every item you purchase from Southwest Silver Gallery is authentic, one-of-a-kind and handcrafted from only the best stones and materials available. Our jewelry is designed to be something you can pass down through generations. We want to provide you with pieces that you’ll never need to replace because they’re made to last. Why wear mass-produced jewelry when you can have something that’s uniquely yours? Each of the pieces we sell are hand-selected by our team, ensuring that the stones and materials are of the highest quality. At Southwest Silver Gallery, we take pride in providing you with pieces that are distinctive and designed to make an impact. We want you to have something exceptional and stunning that you’ll never find anywhere else. Shop our stunning selection today.